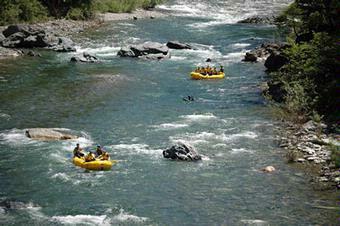 The “Maytag” section of the Yuba River rafting trip is a classic springtime rafting experience. Check-in at Convict Flat Day use area at 10:00 AM on the morning of your trip. You’ll be geared up and driven to put-in where our staff will give a safety orientation and paddling instructions. We’ll launch and run the upper section of Class 3 &4 whitewater including “Ramshorn” and “Gauge” rapids. We’ll stop for lunch at a beach along the river. After lunch we’ll head down the lower section of class 4 rapids including “Two Pair” and “Royal Flush”. We’ll pull over to scout the crux of the run “Maytag Rapid,” an intense class 4+ cascade which everyone has the option to raft or to walk around. After this, there’s class 4 “Son of Maytag” lurking around the next bend of the Yuba River. Take out is 2 miles downstream where our bus will meet us and drive us back to Convict Flat. Plan to be back to your car by 4:00 P.M.
Our class 4 private charter trips are designed so that no other individuals or groups will be sharing your trip. This is a perfect way for families, businesses and any group to keep your river experience and videos to yourselves. Our custom charters also allow us to taylor the trip to your liking. We can change meeting times, sections of river that we run all based on your preference in order to make this class 4 trip truly memorable. If you have a group please contact us for a special quote. 10:30AM - After suiting up for the trip and a brief orientation we will board the bus for a short ride to the Put-in at Goodyears Bar. Your guides will offload the equipment and begin a safety talk for all participants. 11:00AM - Trip departs on river. The first mile serves as a nice warm-up with several fun class 3 rapids. We'll run a 6 mile section with mostly class 3+ and 4 rapids including "Rams Horn" and "Gauge" Rapids. 12:30PM - Lunch at our riverside picnic at Convict Flat Day Use Area. 1:30PM - We'll head downstream into the most action packed section of the trip. The first class 4 rapid we'll run is "Two Pair" followed by a nice roller coaster ride through "Royal Flush" rapid. After a short section of riffles we'll pull over above a horizon line with the sound of roaring water from below. This is the famous :Maytag" rapid. We'll pull over and take a look at this one so everyone can decide whether to run it or not. If you choose to run this rapid be prepared for one of the most exciting rides in California! 3:30PM - After running the last few class 4 rapids including "Son of Maytag" we'll end our trip at Lower Carlton Flat. A short ride back in the bus to Convict Flat will be the last of this epic trip on the North Fork Yuba River. Our Yuba trips usually provide lots of good stories and memories for our guests! All trips meet at Convict Flat Day Use area. From Sacramento take interstate 80 east to Auburn. Take highway 49 north towards Downieville, CA. Make sure you turn left where highway 49 veers left at Nevada City (30 minutes from Auburn). About 30 minutes past Grass Valley, you’ll see the Indian Valley Outpost on your left. Our base camp is 3.2 miles past the Outpost on the right. From Reno call our office for a short cut to the Yuba. Driving time: approximately 3.5 hours from SF, 9 hours from LA. When is the best time of the year to raft on the North Fork of the Yuba River? California has rafting nearly year round but the Yuba River runs only in the Spring time from April through June. Early season has the best flows for whitewater and we have discounts for April and May trips. Look here for information. Yes, Class 4 and 5 water does require good swimming ability. A personal flotation device which we provide will keep you buoyant if you happen to swim from the raft. There are not many calm “recovery pools” to keep you from floating down river so Participants must be able to quickly swim back to the raft or shore before the next rapid. Yes, wetsuits are required on all North Fork of the Yuba trips. You will need a full wetsuit whether you rent one from us or provide your own. Contact us if you have questions. You need to bring shorts, swim suit, t-shirt, foot protection (old tennis shoes, booties or sport sandals), and a dry set of clothes for your ride home.Everything that you wear will get wet so plan accordingly. Please do not bring valuable items (i.e. expensive clothes or shoes, jewelry, non-waterproof cameras or other items) on the raft. Under a wetsuit you will wear swimwear or insulated synthetic winter underwear (No COTTON) on cold spring days. On cold days wear wool socks and tennis shoes or booties for extra warmth. For camping trips bring all the camping equipment you need (even the kitchen sink if required) since the Yuba River has plenty of riverfront camping sites with drive in access. We have lists of equipment recommended for all trips on our "what to bring" page for each trip. Do not bring pets to any of our trips. How often do trips on the Yuba River run? We run trips seven days a week from April through June on the Yuba River. If you are looking for a Summer time class 4 River similar to the North Fork Yuba trip try the Middle Fork of the American River. During midweek we have smaller sized groups and the rivers are generally less crowded making the solitude of the trip much better than on weekends. On weekends we generally book out so we run the maximum group size which is 36 persons on the North Fork of the Yuba River. Sundays are sometimes less crowded than Saturdays. Early and late season are less busy than prime season. Not on the North Fork fo the Yuba River. The minimum age is 18 years old. If you have young rafters your best choice by far is the South Fork of the American River..
Change of clothes for after the river. Swimsuit/ shorts (please be dressed in these when you check in). Wetsuits are available to rent at check-in. For large groups please call our office for a wetsuit rental form so we will have all the sizes at the river for you. Wet suit booties are also available for rent at check-in and these work very well with your wool socks. Tahoe National Forest Campgrounds - There are several riverfront campgrounds along the North Yuba which are provided by the USFS. They can be reserved by calling 1-877-444-6777. We recommend staying at Rocky Rest, Carlton Flat, Indian Valley or Fiddle Creek Campground. Yuba Expeditions - Mountain bike rentals -Downieville Downhill!